For this time I have chosen a design which is a scraplift of a layout called Celebrating You Today by Vivre at Oscraps gallery/forum. I thought the small pieces of paper represented the idea of loneliness. 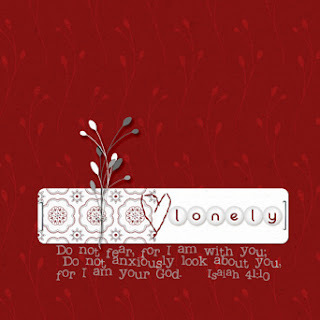 We can be lonely even in the middle of a crowd ( the leaf design on the red background paper ). The stitched heart represents God's love for each of us. The leaves - we should be reaching out to others who are lonely.